The Apothecary Products EZY Dose One-Day-At-A-Time Planner offers the functionality to continuously take into account medication that you have to organize carefully in order to keep you at your very best. It happens, remembering to take your pills and medication can be neglected at times. Even with alarms set and reminders posted, it can still be easy to just ignore these alerts and have another missed medication session. The One-Day-At-A-Time Pill Organizer Planner is a seven-day pill organizer with an individual by day compartments that are 3/4 inches in depth, 4 3/4 inches in width, and 8 inches across. 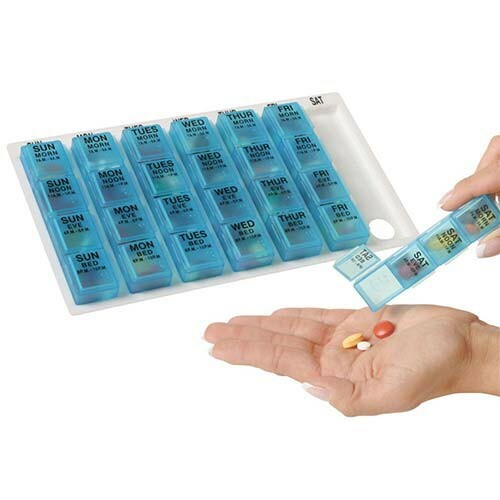 The pill organizer is made in a slim and compact design to fit in most convenient spaces when carrying out the individual container instead of the entire tray. The pill planner features a removable hand tray so you can take only the pills you need to take for that day; instead or lugging around the entire tray. The Medium Sized One-Day-At-A-Time Pill Box can each hold about eleven tablets and is made in a transparent blue color to allow you to see the contents within the container. You can easily organize your pills by morning, noon, evening, and bed. Being convenient is its own reward. For the most helpful device in alerting and reminding you about your scheduled medication, you may want to take a look at the MedELert Automatic Pill Dispenser which offers audible alerts and a lock-and-key capability.